Diabetes is a disease that restricts the body from producing insulin or breaking down sugars properly. Because of this, those with diabetes suffer from high blood sugar and the many symptoms brought about by it. 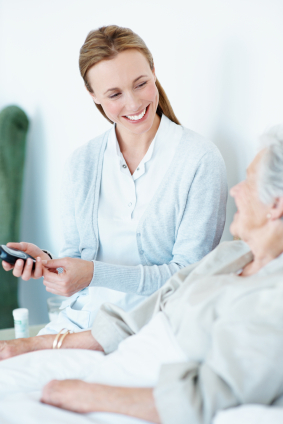 Unfortunately, both type 1 and type 2 diabetes are chronic conditions that will need to be managed carefully to prevent severe pain and possibly death, so contact our home care nursing staff in Sterling Heights today for the diabetic care services you can trust. We go above and beyond to ensure that you understand your condition and have to tools to manage it or prevent it from becoming worse. There are several types of diabetes, and each manifests itself in different ways according to the patient’s health, nutrition, exercise habits, and other factors. The four most common types of diabetes are type 1, type 2, prediabetes, and gestational diabetes. This is the precursor, or warning disease, before a patient develops type 2 diabetes. Unfortunately, it is rare for patients to feel any symptoms, but it is marked by a noticeable rise in blood sugar, which can be found easily through a blood test at your doctor’s office. If left unchecked, this disease could develop into type 2 within 10 years. Unlike type 1 or 2, prediabetes is highly treatable, but you will need to be monitored through lab tests for years (possibly for the rest of your life). This type of diabetes only affects pregnant women, who undergo weight gain and hormone changes that can trigger high blood sugar. Like prediabetes, there aren’t many people who experience symptoms, so a blood test is necessary to diagnose it. This is one of the more rare types of diabetes, as only about five percent of diabetic patients have type 1, according to the American Diabetes Association®. Previously known as “juvenile diabetes,” type 1 is most often diagnosed in children, and is not curable, but it is treatable and manageable through insulin therapy, proper diet, and exercise. Type 1 diabetes is an immune disorder in which the immune system attacks the pancreas, preventing it from producing insulin. Because insulin processes glucose in the bloodstream, enabling your cells to use the sugar for energy, a lack of insulin means that your cells can’t use the glucose, and as a result, it builds up in your bloodstream while your cells are starving for it. Type 2 diabetes develops as people age and is the most common type of diabetes. It is most common in people over the age of 35 who are overweight and live an inactive lifestyle. While this form of diabetes is treatable, and you may be able to bring down your blood sugar regularly through diet and exercise, you will need to be monitored for years by professionals. With type 2, the body is able to produce its own insulin, but it is either not enough to be effective the patient’s diet, or the body’s cells are resistant to the insulin, which means they aren’t absorbing glucose properly. There are many types of diabetes, and many ways in which it can affect your life, but you are not alone. Our diabetes nursing care plan can help you get back on the right track and start living healthy again. Contact us today!